The Missing Link targets the nutritional gap between what nature provides and what’s available in commercially processed foods. 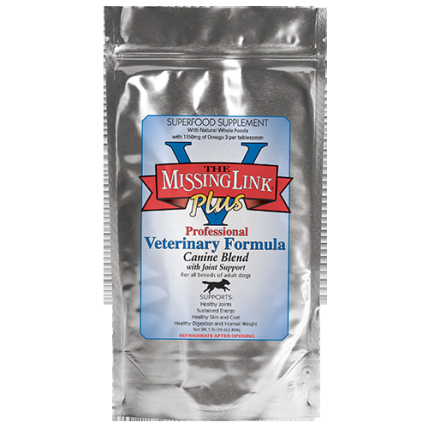 Missing Link Veterinary Formula Plus is formulated with the highest quality glucosamine, the perfect ratio of omega 3 and 6 fatty acids, dietary fiber, phyto (plant) nutrients, naturally occurring antioxidants, trace vitamins, and minerals that provide the ultimate health support. A natural dietary supplement formulated from whole foods and food concentrates with the intention of delivering nutrients that are bioactive, the way Mother Nature made them. These nutrients synergistically provide support to the digestive, nervous, and immune systems. The result is sustained energy, healthy skin, coat and digestion, and normal weight. There are super foods for us and super food supplements for your dog and cat. Missing Link bridges the gap between natural food and commercially processed. 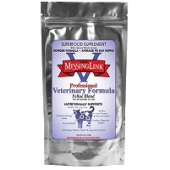 It is time you discover the Missing Link Veterinary Formula Plus super supplement for your pet today!